Cala Gonone is a town in Sardinia, Italy. 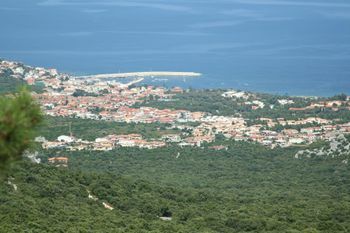 It lies on the border of the National Park of the Bay of Orosei and Gennargentu. Nearest airport and port is Olbia, about 1.5 hours from Cala Gonone by car, Alghero airport and Porto Torres port about 2 hours, Cagliari airport and port 2.5 hours. Take a boat tour to Cala Luna, Grotta del Bue Marino, Cala Mariolu, Cala Goloritzè. You can choose from the variety of tours offered at the local harbour. Rent a boat to explore the Bay of Orosei on your own. A boat hire is available for about 80€ for a day + gas. Visit Gennargentu National Park. Visit Park museum S'Abba Frisca , the biggest and interesting museum in Sardinia. The Park museum “S’abba frisca” is located in the countryside around Dorgali in the Littu valley, at the foot of two limestone mountains Monte Ruju and Monte Irveri; the landscape is one of the most actracting of the Mediterranean Sea. The itinerary consist of two features: nature and ethnography which are interwoven in a single way as though it would recreate a balance between man and nature throughout the use of officinal plants, fruits, barks and what ever people had thought to be useful for their survival activities. Inside the museum there are more than 4000 objects on peasant society distributed in fifteen traditional rooms. The backdrop are fountains, waterfalls, waterworks and megalithic trenches. With an early booking the visitors can watch representation of arts and trades. All the variety of seafood is available at local restaurants. It was a small fishing village prior to becoming a famous tourist destination because of its beautiful beaches. There is a high frequenty of bistros on the esplanade where you can order original italian pizza and other typical dishes like pasta and antipasti . Try the genuine napoli pizza with its thin and crusty dough. If you like pizza, you will fall in love with Cala Gonone. Cala Gonone has a nice beachwalk with plenty of small restaurants and bistros where you can order some delicious cocktails. This page was last edited on 8 April 2019, at 08:02.